The exhibition is really eclectic – the works are really visually and conceptually widely cast nets – with the purpose, at least it seems, to proclaim their passion (not in a extreme Mel Gibson manner) for Christianity and art. The artists on show each have a strong distinct style and statement, and special mention should be made about Wong Shih Yaw’s illustrations in portfolios, the hidden gem by the door that had nothing to do with the show. The result is an oddly placed exhibition, that ran for only 6 days. Much then is needed to decode from the title of the individual works, which are all technically accomplished, and relate them somewhat to Christianity. The works are intentionally codified, from the simplest things that almost seem Surrealistic. They are not the typical Renaissance religious paintings you will find in churches in Florence; they bear the contemporary symbolism of modern living, especially in Samuel and Shirley’s work. Shirley for example, sees visual similarities between the Christian Passover, and Chinese Lunar New Year red couplets placed on doors as decorations. I think the exhibition tries too hard to speak of something beyond the works on the walls could communicate. They really are whispers, placed against the background of floods in Malaysia, droughts somewhere and hurricanes off the coasts of Europe, trying to explain divine hope for all. The specificity of the works are ill-placed, and perhaps too personal and incomplete without the viewer understanding where the artists are coming from, their previous works and so forth. The works seem lost, if we consider the contemporaneity of art making practices, installations, video art that provoke, remind, and reassure. 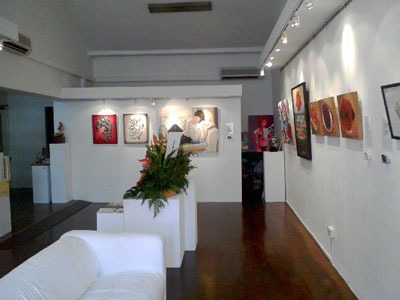 The casual setting of the gallery space doesn’t help, even though some of us are let to believe that the Museum and white walls are temples of art. The 2 Dimensional works in such a white wall, ‘holy setting’ would usually be contemplative but not in a commercial art space. It is perhaps suited elsewhere like a private home, church or a mobile church. This exhibition is thus tiny with reference and reverence to what the title speaks and implies.